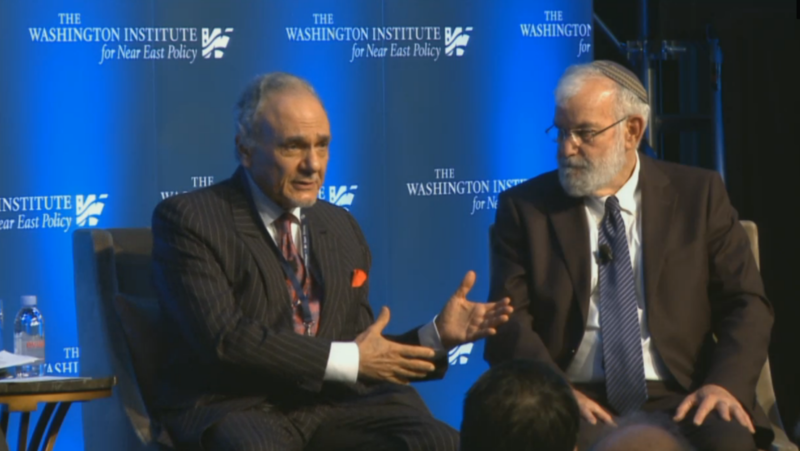 WASHINGTON — In a rare joint appearance of high-level Israeli and Saudi Arabian officials, the kingdom’s Prince Turki al-Faisal and IDF Maj. Gen. (ret.) 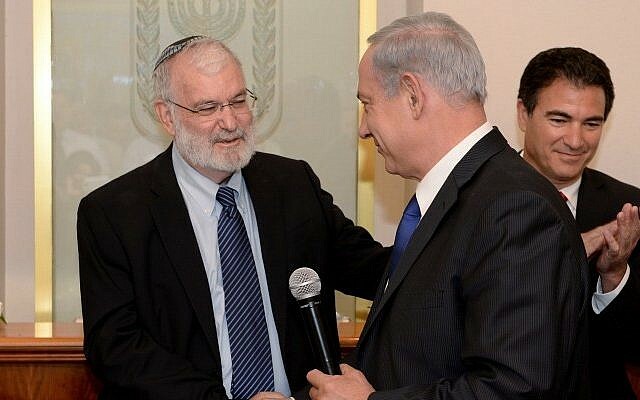 Yaakov Amidror shared a stage Thursday night in Washington, debating ways to advance a two-state solution between Israelis and Palestinians, while also expressing common concerns over the Iranian nuclear deal and growing instability in the region. Their debate was generally very good-natured, albeit with some mutual signs of irritation, occasional rolling of the eyes and other such gestures from Amidror, and with both men sometimes twiddling their thumbs as the other spoke. Al-Faisal, the former Saudi intelligence chief and ambassador to Washington, insisted that the Arab Peace Initiative, a Saudi proposal to end the Israeli-Palestinian conflict that was endorsed by the Arab League in 2002, was the path toward reaching a final-status agreement. Amidror, a former national security adviser to Prime Minister Benjamin Netanyahu, urged the Arab world to form an “umbrella of cooperation” with Israel to bring the Palestinians to the negotiating table. “Netanyahu doesn’t even recognize the two-state solution anymore,” al-Faisal retorted, referring to Netanyahu’s comments before the March 2015 election, in which he said a Palestinian state would never emerge under his leadership. In response, Amidror pointed to US President Barack Obama’s framework plan, presented to Abbas in March 2014, to which, he said, the Palestinian leader never responded. “Maybe your optimistic view of the Palestinians is too optimistic,” Amidror replied, criticizing the Palestinians’ unwillingness to negotiate. 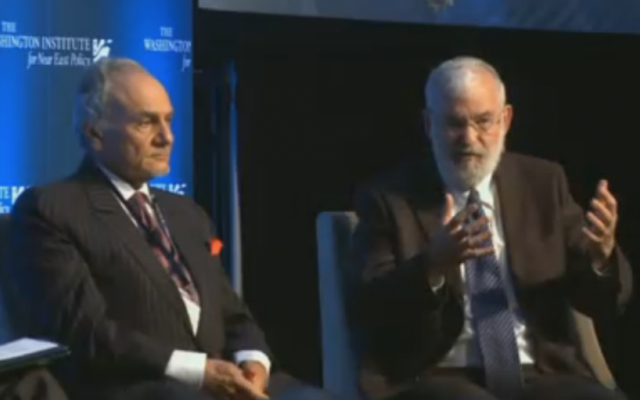 On the Iran nuclear deal, both former officials expressed concern about Tehran acquiring weapons capability. Al-Faisal said the Middle East should remain a “weapons of mass destruction free zone” and that “all options” would be on the table if the Islamic Republic began to move toward the bomb, including Saudi Arabia acquiring its own nuclear weapon capability. While al-Faisal indicated a level of partnership, albeit quiet partnership, between Saudi Arabia and the Jewish state when it comes to regional threats, he circled back to the Israeli-Palestinian conflict to suggest it obstructed Arab states’ ability to work with Israel. 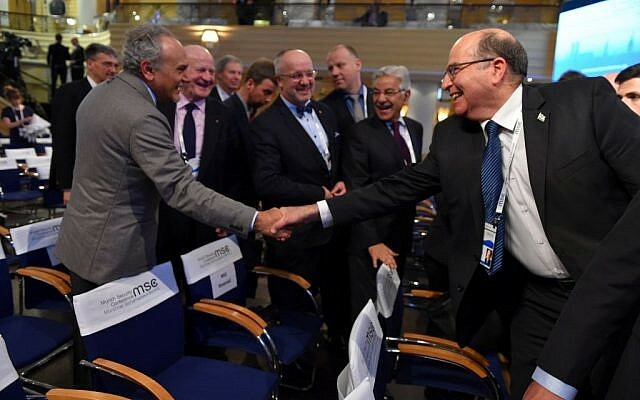 “Cooperation between Arab countries and Israel in meeting threats, from wherever they come, whether Iran, is better fortified if there is peace between the Arab nations and Israel,” he said. The two also presented similar positions on the situation in Syria, including the reign of Bashar Assad and the rise of the Islamic State. “We all know what a monster Assad is,” al-Faisal told those gathered at the event, emphasizing a collective responsibility for the political and humanitarian catastrophe that has unfolded in Syria. “I blame us all for what is happening in Syria,” he said. He contended that Syria was evidence that other conflicts in the region have taken a greater toll than the Israeli-Palestinian one. “The number of Arabs that have been killed by Arabs is greater than the number of Arabs that have been killed by Jews,” he said. The two former officials also addressed the US role in the region. Moderator Robert Satloff, executive director of the Washington Institute, asked the panelists to discuss a recent series of interviews President Obama gave with The Atlantic’s Jeffrey Goldberg, in which the president articulated a vision of US retrenchment in the Middle East. The two men shook hands at the start of the event, but the hand shake was not broadcast in the Washington Institute’s livestream coverage of the event. The evening ended with the two acknowledging that their meeting did not indicate a normalizing of relations between the two countries.